I am satisfied with the product I've received, the delivery was fast, and the Whiteboard seems to be of sturdy construction and serves the purpose for which it was ordered, namely as a playing surface for my family's tabletop fortnightly role playing game session. \n\nWe needed a large white area onto which we could use a projector to project images containing the many maps we use to experience the adventure we are enjoying, being able to use easy to wipe off dryboard markers to display spell effected areas is a nice bonus.\n\nYou should consider offering a detachable plastic cover with a 1 inch square grid across it and perhaps a hexagon grid too. 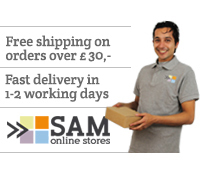 SAM online stores is a brand of SAM International. SAM stands for See, Analyze, and Make. We see a chance, analyse the possibilities, and create products under our own brand name to fit a certain market. This is what we do. We've become quite good at it actually! We're an international company that has developed its strength through innovative own manufacturing facilities, combined with smart distribution and a no-nonsense sales attitude. With these competences, we develop online stores that basically have a formula in their genes, prefectly suited for serving you best. All of our competences make it possible to offer you high service, fast deliveries, top quality products and still at a very sharp price rate! We always center an online store around one of our own top brands, which enables to provide you an assortment and prices that are unmatched. We love doing that. On a daily basis, we ship in between 500 and 1.000 orders per day from our state-of-the-art distribution center situated in the Netherlands. Why are we based there? Because from the Netherlands, we're able to ship to the entire Western side of Europe within 2 days. An extremely competitive delivery time, of which we're proud! 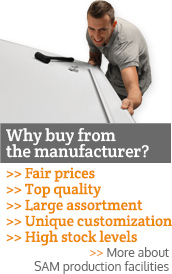 We love developing brands that serve you in terms of price and functionality. We love building an online store around it. And: we're good in sending packages! That's why we say: sending packages is what we do, our products are what we love!